One of the most famous of his paintings “On the River Oka”, which shows a floating barge with tired, submerged peasants in their thoughts. The content of the picture grows out the subject frames. It is wider, deeper, more significant. This is a story about people who are able to endure much, retaining steadfastness and spiritual strength. This statement of poetry of Russian nature, with blue dalits, spring floods of rivers, streams of sunlight. The color, built on a combination of subdued soft colors, corresponds to the general mood of the work. 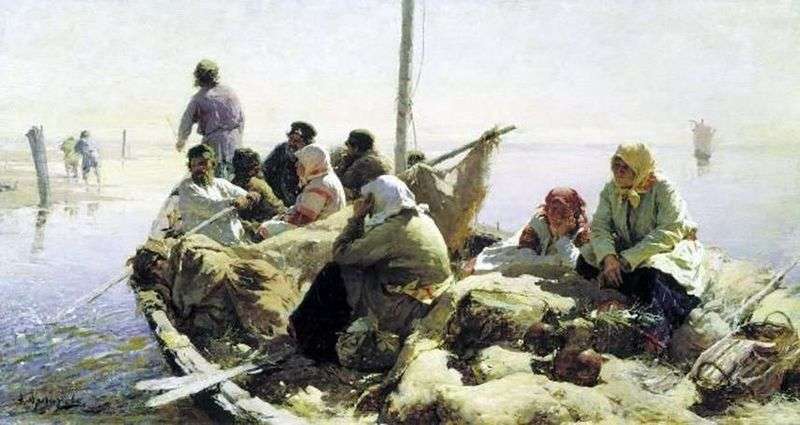 Description and meaning of the painting On the Oka River by Abram Arkhipov.